One of the most difficult and most personal choices in your design is deciding what type of finish your cabinetry will be. Traditional hand wiped stain? Gorgeous paint? Choosing just the "right" color can lead to some very interesting discussions when planning your kitchen! Let's see if we can make this process a little easier...What do we offer, and what options are available within those choices? The beauty of wood grain becomes a stunning element, creating a feeling (so much more than just a look!) that can't help but put a smile on your face every time you walk into your kitchen. We offer a full range of high solids furniture stains, from light and subtle to rich and dramatic. The process starts with stain being carefully hand applied, and hand wiped. Pieces are then set aside; this important pause allows the stain to achieve the necessary depth and readies the pieces for the next step: our sealer coat. Using a catalyzed varnish we hand spray our sealer coat, laying down the proper thickness to provide the foundation of a beautiful and durable clearcoat. Once sprayed, pieces are rolled into the oven, and baked at 130° for twenty minutes. This is not a process that can be duplicated on jobsite-made cabinetry, and is essential for a truly long-lasting and beautiful finish. Next, it's back to the spray booth, where our skilled sprayers apply the topcoat, using another catalyzed conversion varnish. All freshly topcoated pieces head back to the oven, for another twenty minute baking at 130°. This final baking is equally critical, as it promotes the cross-linking between the sealer and topcoat, yielding our famous gorgeous finish. This carefully controlled finishing process cannot be duplicated by any local cabinetmaker. Our Acromapro paint is comprised of one coat of water based stain blocking primer and two coats of water based pigmented acrylic urethane paint. As with all our finishes, we apply this paint in our controlled finishing area that's designed to maximize quality and consistency. We are proud to say this finish is both low in VOC and formaldehyde free. 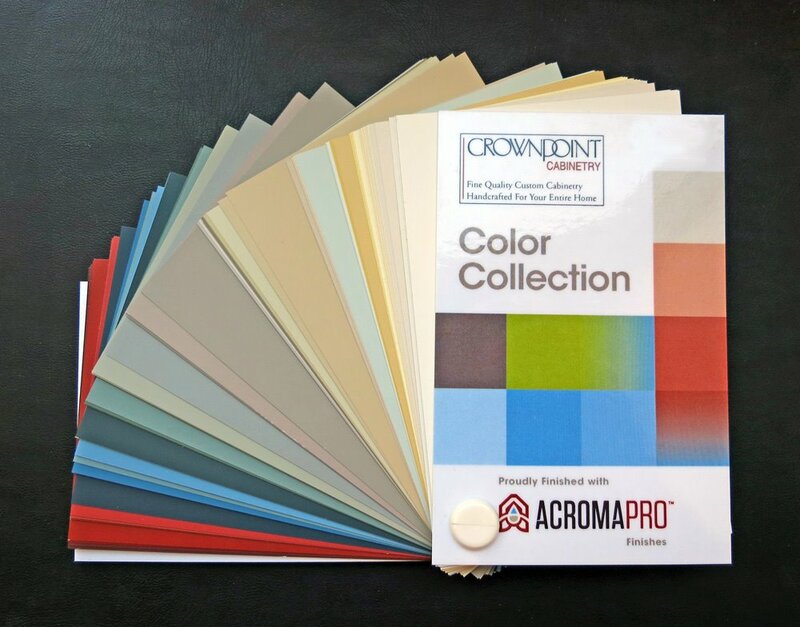 We offer a complete and diverse "Crown Point Collection" of 158 standard colors based on the Sherwin Williams color palette with a premium option to custom mix colors from the entire Sherwin Williams palette as well as the color offerings of other paint manufacturers. This finish is offered in both sprayed and brushed applications. To view our Paint Color Collection, click the image or click here. Burnishing is an option with Milk Paint. (Note: Pine comes standard in burnished only.) Essentially, burnishing is precision sanding of the top color to reveal some of the undercoat. Burnishing can enhance your Milk Paint kitchen by giving you an option to have a contrasting color show through. If you prefer, even use one of our stains as the base coat. Burnished or not, your cabinetry is still given our tough-as-nails finish as described below. We start by hand mixing the powder with water to get the desired consistency, and, using a brush, begin to paint. Milk painting a door, wainscotting, or any part with frame and panel, requires more steps. To do the job right, we paint before the component is assembled. Otherwise, paint can "bridge" between the panel and frame, and over time and seasonal changes, creating tear lines due to natural wood movement. We paint the completed panel, and brush the inside edges of the stiles and rails that make up the frame. Once dry, the parts are brought back to the appropriate team, assembled, and worked as needed. When the entire kitchen has been hand brushed and dried, we spray the sealer coat with our catalyzed varnish. Into the oven it goes, for twenty minutes at 130°. Once cooled, the parts are hand sanded with an ultrafine grit sandpaper, and then rubbed with a tack cloth to remove the smallest traces of dust. Next, it's back to the spray booth, where our skilled sprayers apply the topcoat, using our catalyzed conversion varnish. All freshly topcoated pieces head back to the oven, for another twenty minute baking at 130°. This final baking is equally critical, as it promotes the cross-linking between the sealer and topcoat. This is not a process that can be duplicated by any local cabinetmaker! Unfinished - Perhaps you've always dreamed of your ultimate kitchen arriving, a blank slate for you to express yourself artistically. Our custom cabinetry is available in an unfinished state, sanded with a fine grit paper, ready for you or your painter to explore your creativity. Furthermore, you may choose a stain grade, or a paint grade selection of lumber for your cabinetry. Or, of course, a mixture of both! Primed - As you know, achieving a beautiful finish requires a proper base. To that end, we offer a way for you to still be creative, while saving you time and money with our Primed finish. All necessary parts will be sprayed with a white primer, and your cabinetry will arrive ready for your finish painting at your discretion. Glazed - To the most discerning eye, only a Glazed finish will do. It's the visual interaction between the base color and the Glaze itself that creates a depth and patina unlike any other. Glazing is accomplished using a specially formulated stain, and is carefully rubbed on top of the chosen base color, be it stain or paint (note: not all paint can be glazed. Please discuss options with your designer), prior to sealing the part with our catalyzed varnish. Our Glaze is offered in multiple choices: Van Dyke, Toffee, White, Mocha and Chocolate. Burnished - A well-worn interpretation is handsomely achieved with our Burnished finish. Available either with Acromapro paint or stain, our skilled finishers ensure parts are adequately, yet carefully, advanced in years. Popular in many period style homes.